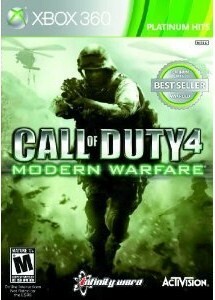 Call of Duty 4: Modern Warfare for Xbox 360 & PS3 only $14.99 + Eligible for Free Shipping! Costs $29.96 at Walmart! Call of Duty 4: Modern Warfare for the Xbox 360 & PS3 is only $14.99 right now on Amazon! These games cost $29.96 at Walmart and the used games cost $17.99 at GameStop! You can score free shipping if you have Amazon Prime or on orders of $25 or more.